Potential Dissemination of ARB and ARGs into Soil Through the Use of Treated Wastewater for Agricultural Irrigation: Is It a True Cause for Concern? Resistance to antibiotics is increasingly being recognized as an emerging contaminant posing great risks to effective treatment of infections and to public health. Pristine soils or even soils that predate the antibiotic era naturally contain ARB and ARGs. This book chapter explores the native resistome of soils and collates information on whether soil perturbation through wastewater reuse can lead to accumulation of ARB and ARGs in agricultural soils. Special emphasis was given to ARGs, particularly the bla NDM gene that confers resistance against carbapenem. 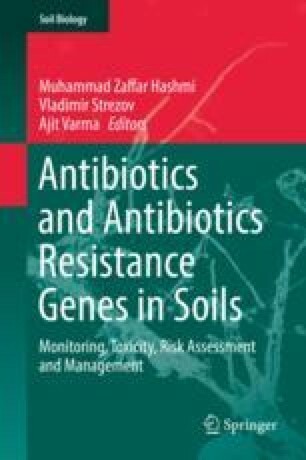 The fate and persistence of these emerging ARGs have not been studied in depth; however, this book chapter reviews available information on other ARGs to gain insight into the possibility of horizontal gene transfer events in wastewater-irrigated soils and plant surfaces and tissues. Lastly, this book chapter visits solar irradiation and bacteriophage treatment as intervention options to limit dissemination of emerging contaminant threats. The original version of this chapter was revised. An erratum to this chapter can be found at DOI 10.1007/978-3-319-66260-2_22.